Transition! It's a word often used in Rugby. You’ll often hear coaches talking about transitioning, nomrally that's from defence to attack, or attack to defence. It’s essentially how a team move from getting the ball into their attack patterns or from losing the ball into a good solid defensive system. Of course the proverbial masters at it are New Zealand but this try from Harlequins Nathan Earle is a wonderful example of transitioning into attack. So I want to run through it and breakdown the excellent awareness of Quins and the defensive errors from Gloucester that result in this try. Kick offs are always an interesting point of the game. It's a perfect point to exert pressure as so many things can go wrong for the receiving team. It’s also a point that if you don’t get your kick off and chase right you are vulnerable to a counter attack which is exactly what we see unfold here. Winger on the edge (Sharples), his job is simply to put pressure on the receiver (Visser). A solid forwards based unit inside him with the 9 in behind (the 9 will drift to the touch line if the kick is too long or they set up an exit play). 15 is holding back to see what happens and can float left or right as needed. 5 across the front with a lifting pod behind the edge defenders and in the middle. between each unit we have an auxiliary player who defends the short ball and can assist either way. What Cipriani is looking to do here is turn that left hand pod around by placing the ball in between them and Visser making them turn (which makes them blind to the approaching chasers) and brings Visser forward into that retreating traffic. Hopefully this will create some indecision maybe leading to a mistake. Ideally Gloucester want this ball dropping just shy of the 22 (bringing Visser far enough forward that they force him out of the 22) stopping Quins kicking directly to touch and as the footage goes on we see Sharples push ahead to pressure Visser. This is good from Sharples but what it needs is Hanson and Grobler to close the door behind him. Something they fail to do. We can also see the Gloucester kick chase is quite disconnected, and while this doesn't matter so much on this phase we’ll see it has a bit of an impact on the next. Visser having stepped Sharples attacks the gap between Hanson and Grobbeler and while he doesn’t quite get away we can see it’s enough to get behind that Gloucester chase line, they now have to turn, and retreat, and we can see all their shoulders are turned in and they are looking at the ruck. On the other side we can see Mike Brown communicating with Lang that they have the numbers and the defence isn’t set. Brown gets a lot of stick as an attacking force but he’s absolutely instrumental in this try. Right from the off we can see he has already identified the potential pressure point in the Gloucester defence, which we’ll see play out and exploited. Despite the quick ruck Quins do really well to get into the now familiar hinged pod formation so prevalent in modern Rugby. hinge and play out the back to Brown. latch on the primary if he carries. That three man unit is able to hold this entire Gloucester defensive press. As the ball is played out the back we can see Gloucester's defence is already showing huge gaps. 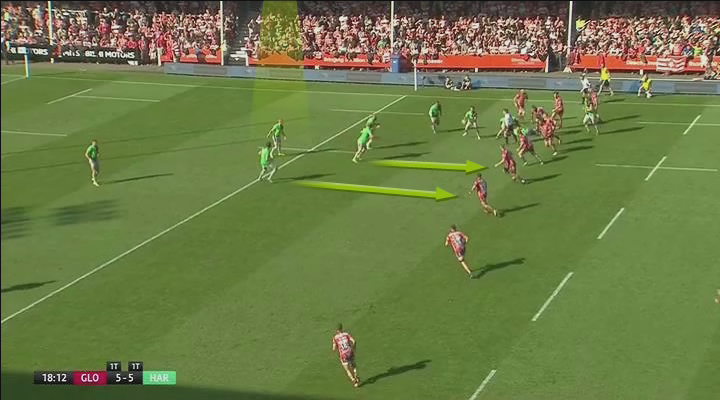 First Brown fixes Polledri and here we see exactly how confused the Gloucester defence has now got itself. Cipriani is floating in behind and ideally Gloucester would like to see him rush up and close this gap off. Instead he’s watching the ball and then realising Trinder has already bitten in drifts out and behind to the edge and this is where Quins make their line break. That’s pure miscommunication from Gloucester and that disconnect is where the try is really created. 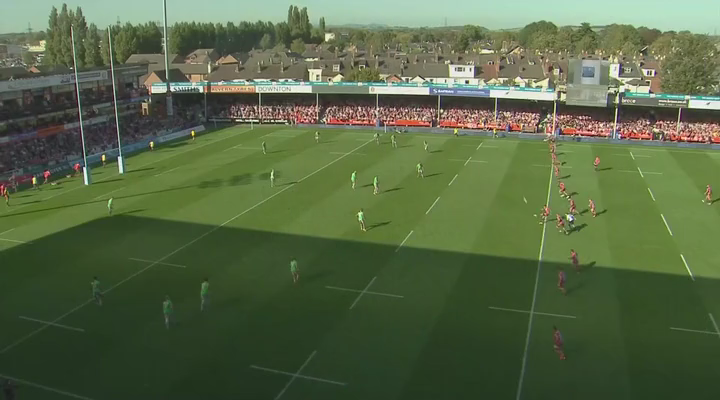 Up until this point Gloucester have had a chance to shut it down, but once the line break is made we can see superb running lines from Quins and Marchant’s pace takes him clear and drawing Hudson just enough sets Earle loose. It’s a valiant effort from Hudson to get back but it’s too little too late and Earles power and momentum takes him over for a superbly taken try. A slightly poor kick chase, slow to reset on defence, great early vision from Brown and Lang. It’s interesting how all these little things can add up to such a big impact on a game and I think this illustrates how vulnerable teams are from the kick off, or in fact any point where they have a defensive system that has to go from one formation to the next. That little break in communication is devastating to Gloucester's chances of shutting it down but it's important to understand it's a chain of events that lead to it they get the initial chase wrong, that impacts on their defensive set up for the next phase that then impacts on their ability to shut down the Quins attack. Of course it’s not all on Gloucester, it’s fantastic vision and attack from a young exciting Quins back line bristling with strike runners and pace to burn. Personally Gloucester and Quins two interesting teams, they may not be pushing top spot come the end of the season but their progress over the next 12-18 months will be fascinating to watch.